The challenge was to create an element that hangs outside the center 2.5" x 3.5" rectangle. I wanted to also make a card for a neighbor who is going through some scary medical issues. The poppy stamp is from Penny Black. I used Brutus Monroe Detail ink to stamp and colored the poppy with watercolor pencils, blender pencils, and an aqua pen. I added some cute little diamond dewdrops but thought it needed a little more sparkle, so out came the Versamark pen and Pear Ex. 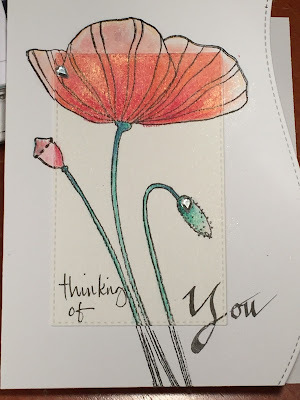 The sentiment was hand-lettered because I realized the only room I had to stamp would require stamping across the edge of one card layer, which has never worked well for me!